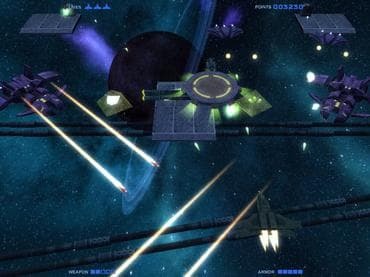 3D arcade space shooter with classic gameplay. Human space colony was attacked by aggressive alien invaders. The colony is lost but you can try to save captured people. Download free full version game today and start your mission! Free Games Features: - 3D top-down scroll shooter; - Tons of enemies, weapons and bonuses; - Nine large missions with a huge Boss at the end of each; - Unique and truly addictive gameplay; - Unique power-ups; - Save / Load game option; - Game statistics; - Free full version game without any limitations. If you have questions about Star Rage game, please contact us using this form.